The landscape of West Oxfordshire ranges from the flat countryside of the Thames valley in the south to the higher undulating land of the Cotswold Hills in the north and west. The area is known as the Oxfordshire Cotswolds and many of its villages are built in the attractive Cotswold limestone and are typical of Cotswold villages in architectural style. From Carterton northwards the ground gradually rises towards the Cotswolds and from Burford and Witney north the land is attractively undulating. North of Burford is the Cotswolds Area of Outstanding Natural Beauty which includes a sizable chunk of West Oxfordshire. At one time the historic Wychwood Forest covered an area that stretched from Woodstock to Burford. By the Middle Ages much of Wychwood Forest had been cleared for farming and now hardly any of it remains as woodland. Its name lives on though in a remaining small area of woodland between Charlbury and Leafield. Wychwood Forest has given its name to three villages, Milton under Wychwood, Shipton under Wychwood and Ascott-under-Wychwood which together are known locally as "The Wychwoods". Apart from the Thames, the three main rivers of West Oxfordshire are the much smaller rivers Cherwell, Windrush and Evenlode. Of the three the River Cherwell is the biggest, and it is part of West Oxfordshire's eastern boundary as it flows south to meet the Thames at Oxford. The River Windrush has its source high in the Cotswolds and crosses Oxfordshire in a picturesque valley as it makes its way towards Witney and then on to join the Thames at Newbridge. The River Evenlode, also with its source in the Cotswolds, crosses the Cotswolds Area of Outstanding Natural Beauty in a wide and open valley and eventually joins the Thames near Cassington. The largest towns of West Oxfordshire are Witney and Carterton, the latter having developed from a small settlement mainly during the second world war due to its proximity to RAF Brize Norton. 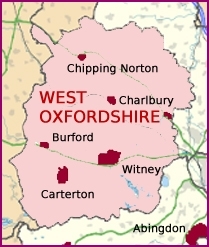 Other towns are Burford, Charlbury, Chipping Norton and Woodstock.